Renato Fasano (Naples, August 21, 1902 – Rome, August 3, 1979) was an Italian conductor and musicologist particularly associated with 18th-century Italian works. 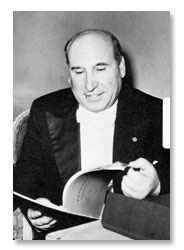 Having studied music in his native Naples, Fasano established in 1947 the chamber orchestra Collegium Musicum Italicum later renamed I Virtuosi di Roma. This small orchestra helped popularize Italian Baroque music. He conducted widely in Europe works by such composers as Corelli, Vivaldi, Pergolesi, Baldassarre Galuppi, Alessandro Marcello, and Giovanni Paisiello. In addition, he founded the "Piccolo Teatro Musicale Italiano" in 1957. The best-known of Fasano's recordings (most of which were for the RCA label) is that of an opera by a non-Italian musician: Gluck's Orfeo ed Euridice, with Shirley Verrett, Anna Moffo, and Judith Raskin in the cast.